Manchester MST high quality radial trailer tires and Manchester STB high quality bias ply trailer tires are designed for towed trailer applications. Both the radial and bias ply constructed tires are made with a durable tread compound with a tread pattern designed for excellent tread wear. Manchester MST and STB trailer tires feature black wall styling and are available in various wheel diameters from 13”-16”, with varying tread ply and load ratings based on tire size and wheel diameter configuration. 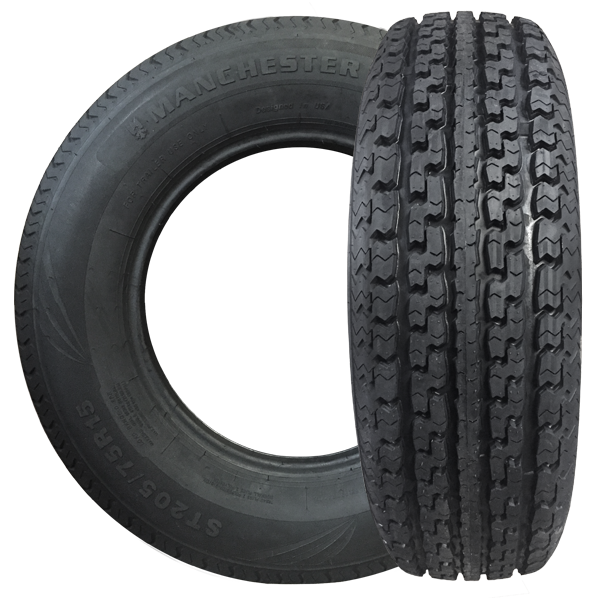 Manchester MST and STB trailer tires are special purpose designed tires for use on trailers. Manchester tires are not intended to be used on cars or light trucks. Note: Max load provided is for Single use applications. The letter R in the tire size denotes that model as being a radial tire; otherwise it is a bias tire.